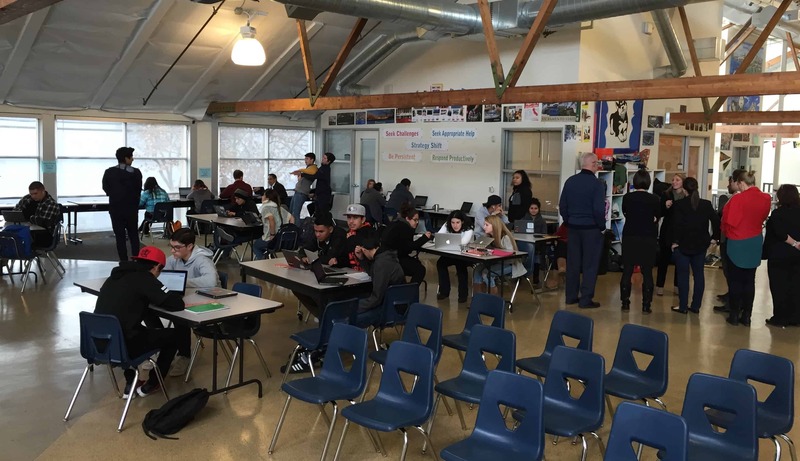 Summit Prep opened in 2003 as the result of a group of Redwood City parents seeking a better high school option. Prep is flagship of Summit Public Schools, nine intentionally diverse schools (with two more approved). 1. Broader aims. Summit describes desired student outcomes in four quadrants: content, knowledge, cognitive skills, habits of success, and real-life experiences. These are mapped to learning experiences (as shown below) which are supported by structure, schedule, staffing, and systems. 2. Open space. Summit schools have a mixture of classrooms and big open spaces that support individual work, team projects, class activities, and large presentations. 3. Personalized Learning Plan. Every student has a Personalized Learning Plan. What started as a paper based system has gone through several iterations. With the help of Facebook engineers, the PLP is now a sophisticated learning platform that serves up playlists of open content, helps students manage projects, tracks progress, and keep students on schedule (see below). Parents can log into PLP and get the same view. 4. PBL. The goal at Summit is college and career readiness. For the last five years there has been a full court press on self directed learning including daily learning choices, the opportunity to fail, and customized projects. Students we talked to enjoyed self directed research projects and deep dives into bioethics. 5. OER Playlists. Summit students build content knowledge with the help of digital playlists of open education resources (OER). Playlists provide just-in-time preparation for challenging projects (see below). 6. Advisory. Most Summit days concludes with a quick an advisory period called a community meeting (see 15 elements of quality advisories). Students meet with their advisor (called a mentor) weekly for goal setting and progress monitoring. 7. Expeditions. Four times a year Summit students choose from a variety of electives and internships offers by the central office team and community partners. 8. Professional growth. Summit teachers connect weekly with job-alikes across the network. The expeditions and summer sessions provide about 50 days of professional learning every year (see feature). 9. Diverse schools. About half of Summit Peak students live in or near poverty. Locations and outreach efforts guarantee intentionally diverse student bodies at all Summit schools. 10. Basecamp. In addition to adding a few schools a year to the managed network Summit is providing platform access and training to 19 partner schools through Basecamp (see feature). Summit is adding a cohort of partner schools nationwide. Applications are due December 18. Join them for a webinar Thursday, December 10 2:00-2:45 PST (click here to register). Hands down, the best personalization software I’ve seen. I’m going to connect and see we can extend their curriculum down to lower grades. Project Time: The bare minimum is in place for project based learning. Whereas teachers could be trained on the gold standard of PBL from the Buck Institute, teachers receive no formal training on high quality PBL. The cognitive skills come from a rubric that is used across all classes and is confusing and frustrating for teachers; they do not have common definitions of what these skills mean and the student outcomes are unreliable. Personalized Learning Time – Content playlists are links on a grey background. They are dull and uninspiring. Students are not learning content this way, but instead learning how to game the system by completing as few activities as possible to be able to pass the content assessment (which they can take over and over again anyway). Mentor and Community Time – This is supposed to be based on habits of success, but teachers/mentors are not using them…because the habits weren’t even fully articulated until this year and will be used next year And how have teachers/mentors been trained to handle conversations about such personal, psychological and social issues? They haven’t. Expeditions – Many students don’t take these classes seriously and see it as a time of the year to take it easy. These are not electives that inspire passions or support career readiness, they are seen by students as gaps in the academic year. If you are impressed by open spaces then you are looking for the wrong things. And if you are focused on open spaces, then don’t look for the open spaces, look for the evidence to show that they are effective. Where is it? And also check out the spaces for libraries (book shelves), recreation areas (parking lots) and lunch (hallways). Do more with less? I think a little more would be nice. 3. Personalized Learning Plan – It’s “go at your own pace,” but the vertical line that progresses across the screen over the course of the year shows where you should be. The struggle for many students ends up being how to “catch up to the line” rather than “How can I learn more?” or “How am I growing?” or “How is this project connected to my interests, my background or my future?” The PLP does not “keep students on schedule,” the teachers who are working day-in-day-out are the ones who are doing that. There are too many projects. Period. The projects end up feeling like extended assignments, not a deep dive into a topic that the students care about. And PBL is not SDL. To mention these together shows how the gold standard of PBL has been lost (or not even considered). And what self-directed learning actually looks like is teachers crafting every activity of the class period, down to the minute and leading students through the day with powerpoint slides. Open work time is not the same as self-directed learning. But if you disagree, then I guess you could say that the bare minimum is in place to call it self-directed learning. So, if you call this innovative then you are operating under a Lean Startup concept of the term. How can playlists provide “just in time preparation for challenging projects,” while students “go at their own pace”? If the playlists need to be completed in time for the projects then there is a timeline for the students to follow. And if they do not get there in time, the students are now behind on playlists and unprepared for the projects – because everyone does the projects at the same time too. These playlists are lists of online resources and teacher generated resources that reflect a wide range of voices and reading levels. They are a struggle for English language learners and special education students and there is little support/scaffolding for these students to navigate the playlists. Informally called “10 minute time” this is a time of the day where most mentor groups just do something to blow off steam. While mentors generally have positive relationships with the students in their mentor group, there is no formal training on how to be an effective mentor, especially on how to be an effective college counselor as an 11th and 12th grade mentor (the wealthier students just hire a private college counselor which just widens the opportunity gap). Untrained teachers. Not enough course offerings. Many students don’t take it seriously. Teachers now spend most of this time doing self-directed learning, just like the students do, which basically looks like individual teacher work time. This is too bad because TEACHERS ARE THE HEART AND SOUL OF THIS ORGANIZATION. THEY ARE OVERWORKED, UNDER-APPRECIATED, AND UNDERPAID (especially in the Silicon Valley schools). While Summit serves a diverse population of students, the schools do not support nor celebrate the diversity of the students. With the shift to individualized learning, Summit has lost sight of designing effective group work for heterogeneous classrooms and paying attention to the social and cultural issues that arise with a diverse group of learners. There are racial tensions among students. There is a lack of empathy and understanding between the rich and the poor students. And does the diversity of the faculty, administration and Summit leadership reflect the diversity of the students? Not even close. We can only hope that other schools will take these ideas, which are good on paper, and translate them into something that is more than the bare minimum in practice.